Bringing a new puppy or older dog into a home with children is an exciting time for both the family and the new pet. Make the experience as happy as possible by matching the breed of dog to the lifestyle of your family. Here are the list of dogs will tolerate the rough and tumble lifestyle of a family with small children. Golden Retriever: The golden retriever is one of the favorite breeds for families. This breed of dog is one of the most playful breed out there. A golden retriever does not bark excessively, enjoys spending time with people and is very loyal to every family member. Basset Hounds: If you want a more laid back dog for your family, look at the Basset Hound. This dog does not get excited easily, which makes it the perfect choice for families who have docile children. This breed loves being with the family; however, it will not get under your feet the way other dogs will. Labrador Retrievers: Labs are listed as one of the most popular dog breeds by the American Kennel Club. A Labrador Retriever can quickly learn the rules of your house. These fun-loving dogs are full of energy and will play for hours. They are easy to house-train and love learning new things. Beagles: Beagles make wonderful family members and are great with children. These smaller dogs are very intelligent and are super easy to train. Beagles are gentle dogs are very protective, which can be great for families with small children. Collie: If you want a dog that will play with your kids and protect them from danger, look no further than a Collie. These dogs are independent, yet are easy to train. A collie is a larger dog, yet it is a very gentle pooch. Poodle: The Poodle is a great choice for children with allergies because it doesn't shed. This intelligent pooch can become a kid's best friend. 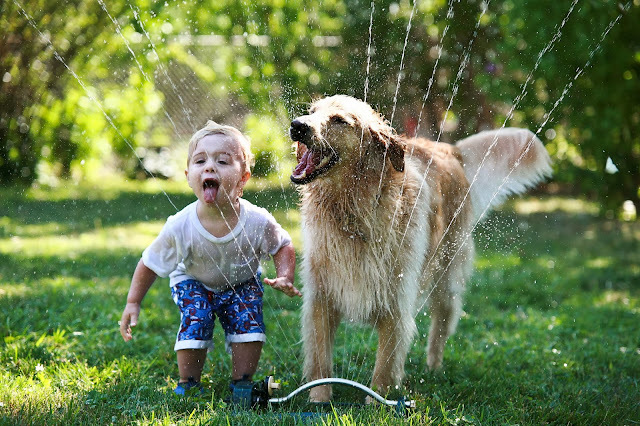 The dog's friendly nature and patience make it the perfect partner for your child. Bichon Frise: If you are looking for a small dog, a Bichon Frise may be the perfect choice for a family with small children. This fun-loving dog loves to play and sheds very little. This intelligent pup loves to spend time with the family and enjoys playing lively games of fetch. There are a lot of breeds that do well with young children. Introduce your children to your new pup and teach your children the proper way to handle a dog to help prevent injuries from occurring. Soon, your child and your pup will be the best of friends.